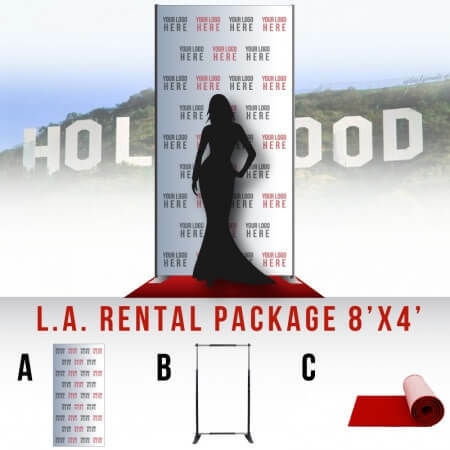 If you are located in the Los Angeles area, you can purchase this 8′ tall x 20′ wide banner and RENT the stand and carpet! Receive 5% off when you rent this Razzle Dazzle package! Vinyl Banner – High-quality, heavy-duty matte vinyl banner. Durable and flexible. It will not rip or tear outdoors. 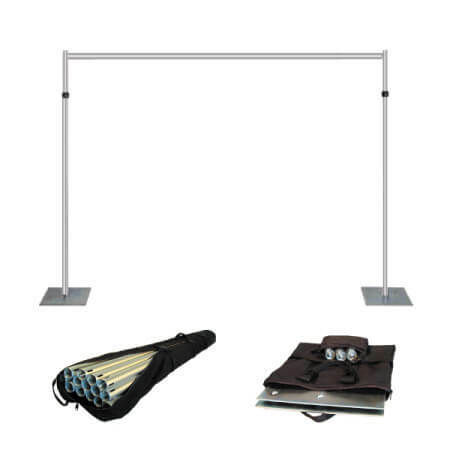 The banner has a pole-pocket at the top so that it can be attached to the stand easily. Zip ties are included in the order which fasten the banner securely to the stand, making the banner taut and beautiful. This banner is rolled up on an 8′ cardboard tube to prevent wrinkles and creases. This banner should not be folded. Soft Heavy Knit – upgrade to this non-glare fabric material which is soft, flexible and wrinkle resistant. This backdrop is foldable. This 8′ x 20′ pipe and base rental is very easy to set up. 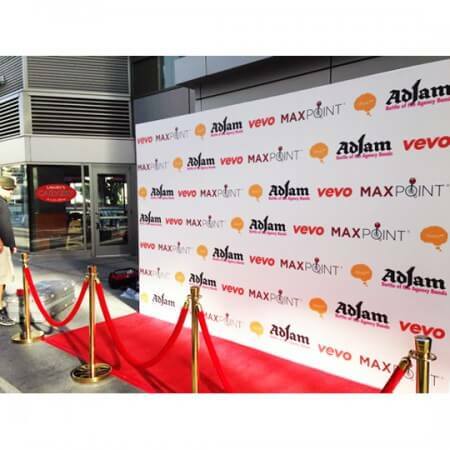 The beautiful, red carpet will give the finishing look to your step and repeat display. 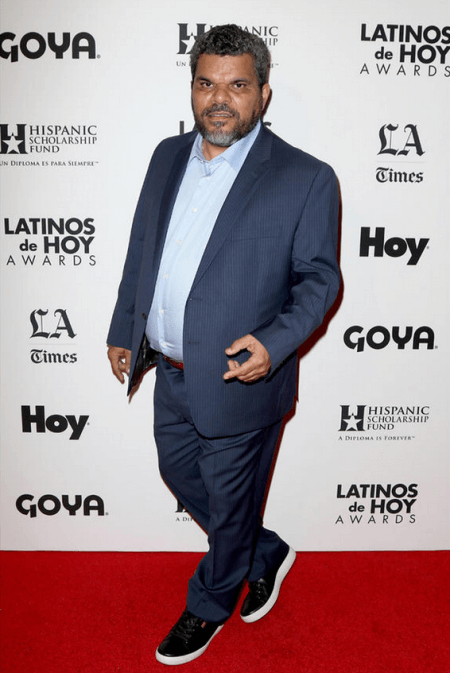 There is something about red carpet that really invites your guests and VIPs to get their picture taken! Indoor or outdoor use. Sets up easily. 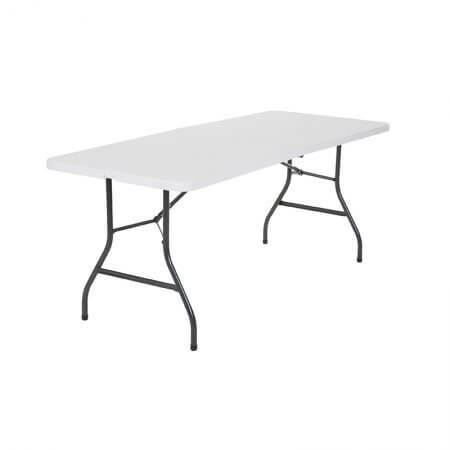 Optional: Add Linen 6 ft. Fitted Polyester Tablecloth Rental is for 1-3 days. 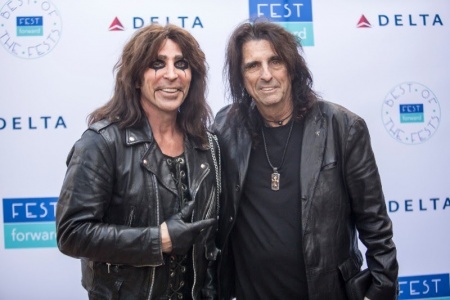 8'x20' step and repeat backdrop for larger events. 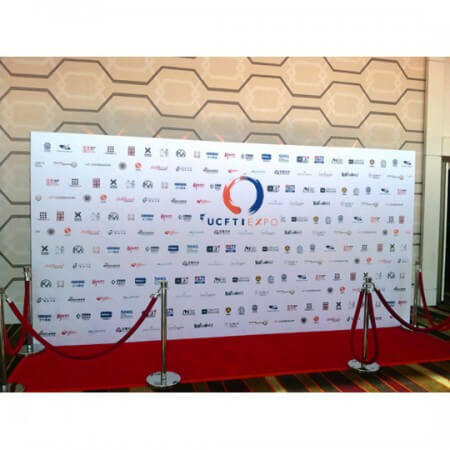 A Step and Repeat Banner is a backdrop display that has one or more sponsor logos repeated in a step or diagonal alternating pattern. 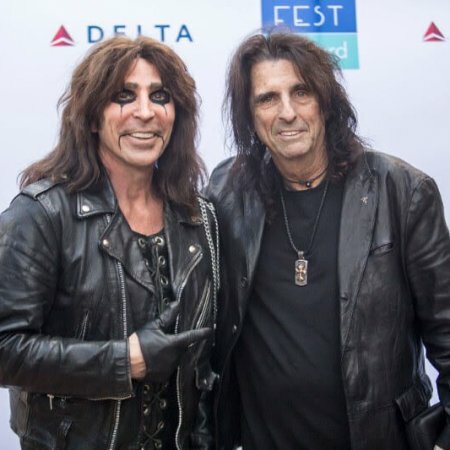 This means that no matter who is photographed, the company name or logo will always be seen. We are #1 when it comes to step and repeat printing and fabrication. 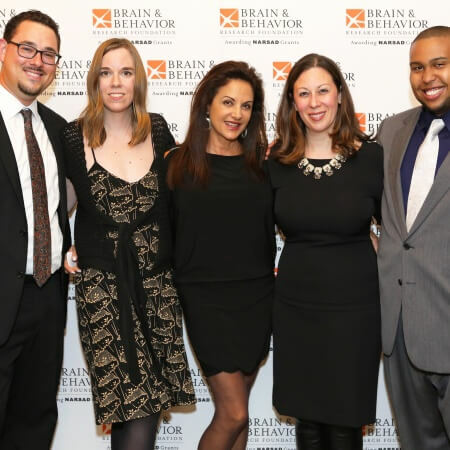 We offer high-quality step and repeat backdrops in a variety of materials. 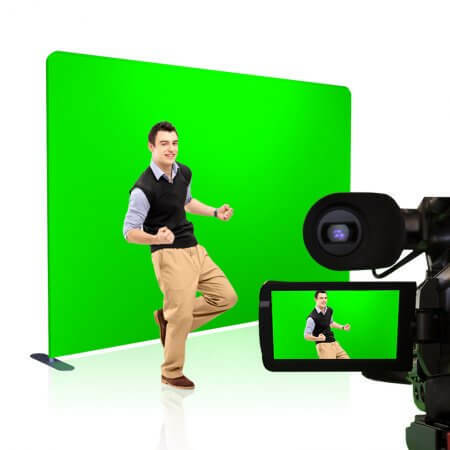 Ordering your backdrop is quick and easy. Simply choose your material and add-on options and checkout online. 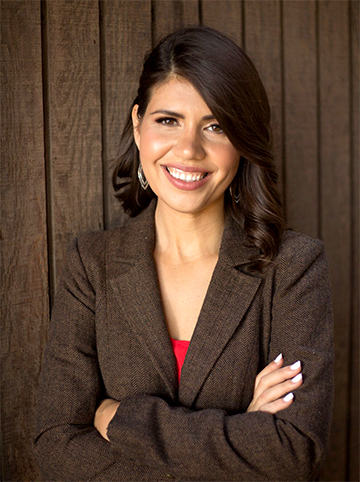 You may call us anytime at (818) 434-7591 or email us. Rent a red carpet for your event! 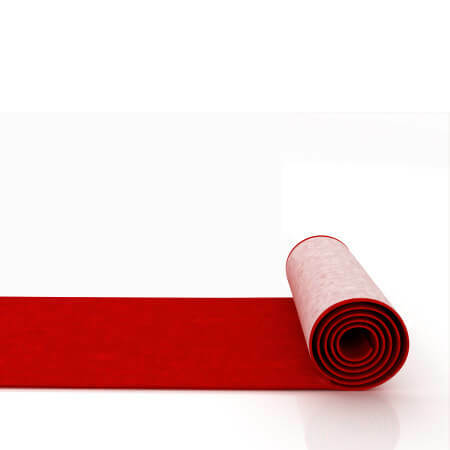 Beautiful, red carpet perfect for those Hollywood-themed events! 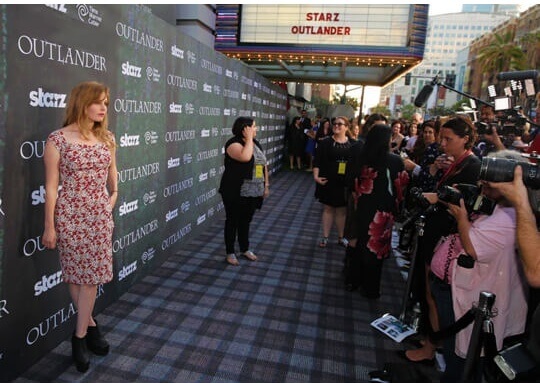 A red carpet in front of a step and repeat banner will encourage guests to get their photo taken! 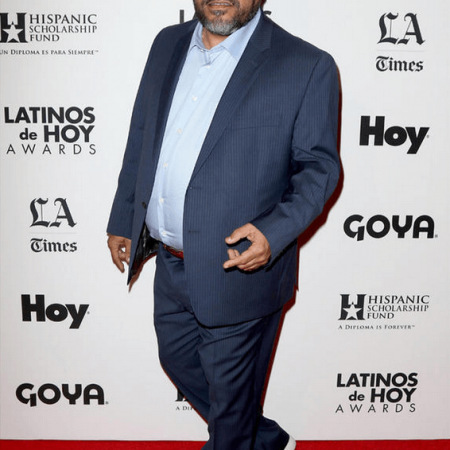 If you are in the Los Angeles area, save money by renting a red carpet. Our rental carpet is not bound. Gaffer's tape is used to tape down the edges to avoid tripping. 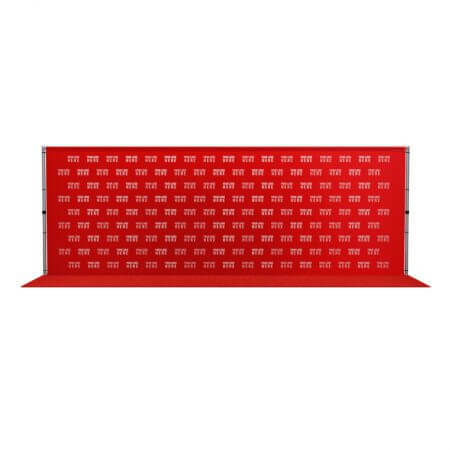 The 8' x 6' step and repeat is one of our popular backdrop sizes. 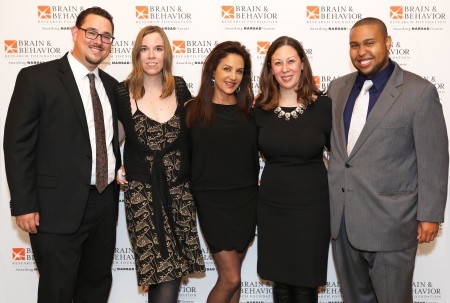 It fits roughly 2-4 people in front of the backdrop when taking photos. We recommend upgrading to the non-glare fabric material for a more elegant look and to avoid camera glare in photos. 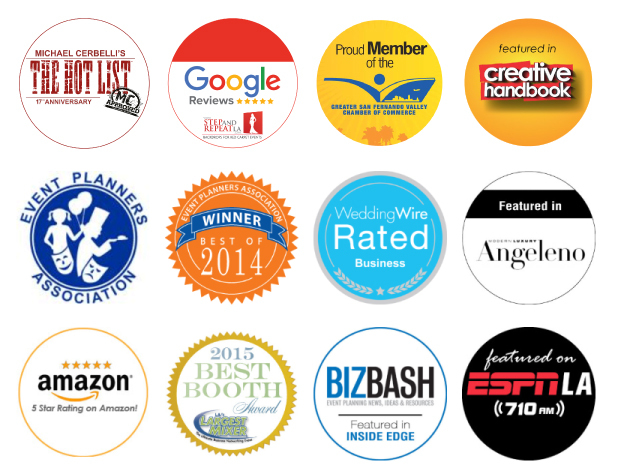 Planning a large event? 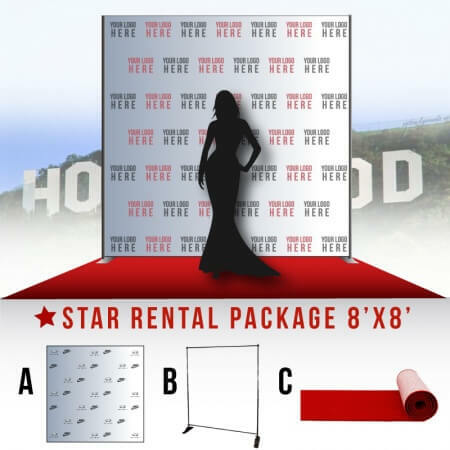 Are you looking for a sleek, professional media wall for red carpet photos? We are the leaders in Media Wall fabrication and installation. 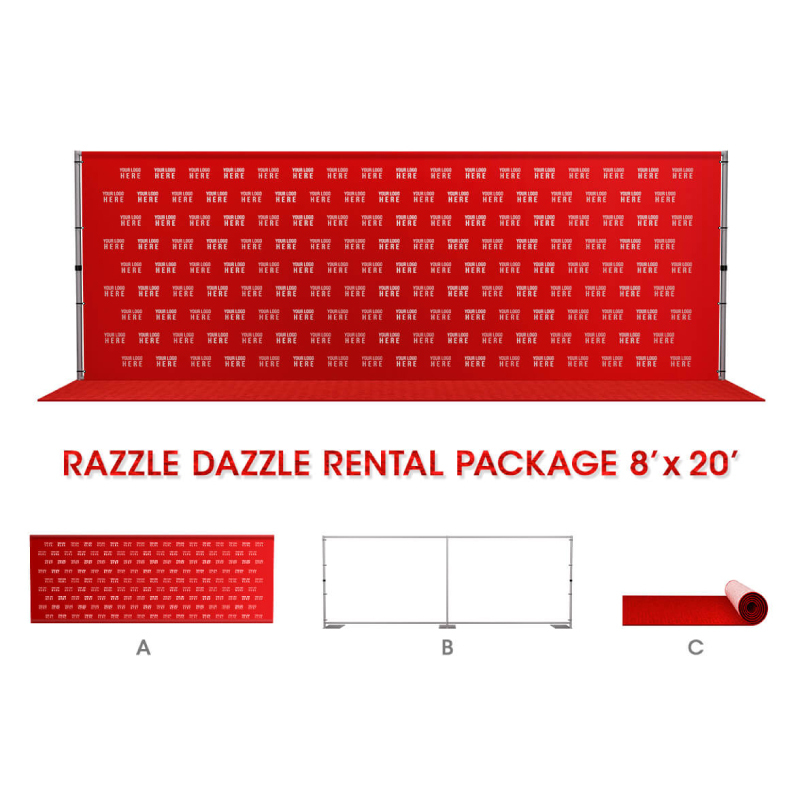 This package includes an 8' x 20' fabric print stretched tightly onto a rigid wall (made up of hard-paneled flats) with a 20' x 4' red carpet. This is not a vinyl banner stretched onto a pipe and base frame. This is a unique, non-glare, seamless wall that is professionally installed by the Step and Repeat LA team. Price includes delivery, set-up, takedown and removal of items.